We knew we were going to love it, but the La La Land Honest Trailer is even better than we could’ve hoped. While there’s a lot to (affectionately, perhaps) poke fun at in the Oscar-winning film, from director Damien Chazelle’s obsession with (white) jazz musicians to what’s at its core a story of two brutally selfish people pursuing their lofty goals, there’s always going to be the elephant in the room when it comes to talk about it. And that elephant is named Moonlight, and it is a stunning cinematic achievement that deserved more than the shoddy treatment it got at the Oscars. Apparently the Honest Trailer people agree, because halfway through they interrupt the La La Land trailer to instead switch to a Moonlight trailer and we’re loooooving it. We love this (petty, but funny, and apt) turn on that infamous Academy Award fiasco almost too much. They’re even self-aware enough to poke fun at the end, about how unfortunate it is that these two movies will be forever linked — and about how they’re clearly not helping that. 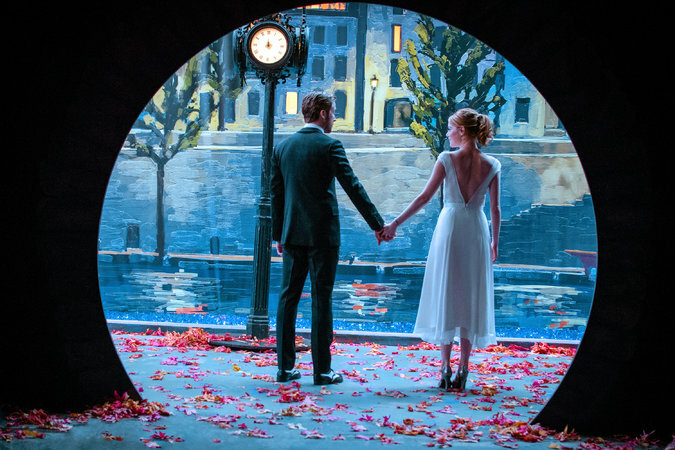 Not that getting an original musical produced, especially without a star attachment which La La Land originally lacked when being shopped around, isn’t a fairly big achievement in the modern cinematic landscape. Not that we didn’t like La La Land. But honestly, it’s going to be a loooong time before we stop talking about Moonlight to make up for those tense few minutes at the Academy Awards where people were talking about La La Land instead.